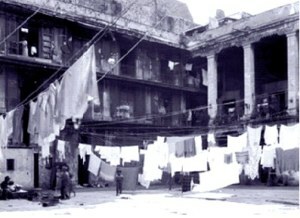 Mexico City’s inner city slums date from the regime of Porfirio Díaz (1877–1910) which stimulated rapid railroad expansion and industrialization north and northwest of the city center. The industrial zone expanded out along the rail lines into the areas now known as Azcapotzalco and Gustavo A. Madero. With this expansion, the upper classes sold or abandoned their inner city colonial mansions and moved further west, deliberately avoiding noisy and polluted industrial areas. Their abandoned multi-storied mansions were converted into vecindades, cheap tenements with individual rooms rented to families. 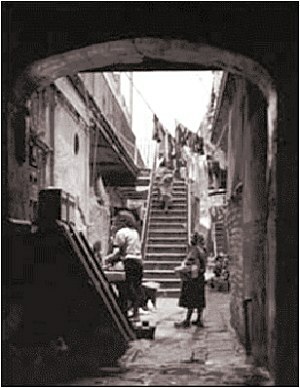 Vecindades, with a shared central court, kitchen and latrines, became Mexico City’s first slums. They encircled the center on the north, east and south; the west side remained upscale. As these eventually became overcrowded, incoming migrants moved into cheap, undesirable housing in the industrial zone or on the urban periphery. Rapid industrialization after World War II brought another massive wave of poor immigrants. They initially headed for the low rent vecindades which had expanded as developers built new tenements using the old vecindades as a model. Following government-mandated rent control, many investors abandoned the vecindades, depleting an already poor housing stock. Affordable housing emerged as a paramount concern of low-income residents; most were forced into colonias populares either on very steep hillsides or the urban periphery, such as Nezahualcoyotl. While vecindades are most closely associated with Mexico City, they also emerged in Mexico’s other large cities. About ten percent of Mexico City’s current residents live in vecindades. Apreciamos su interés en geo-mexico.com Desafortunadamente, no tenemos ninguna información disponible en este momento con respecto a esa vecindad. [We appreciate your interest in geo-mexico.com. Unfortunately, we have no information available at this time with respect to that neighborhood. Soy estudiante de cine y me encuentro buscando locación con urgencia para la carpeta de producción de mi tesis. Ando buscando una vecindad que tenga una ventana amplia frente a otra y esta parece perfecta. Será posible me des la dirección?